Entrance to the Kenmore Hangar. 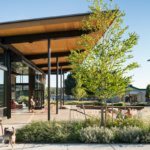 With the 5,000-square-foot Kenmore Hangar, Seattle-based Graham Baba Architects (GBA) and landscape architects HEWITT have brought a new “Town Green” and community center to the heart of Kenmore, Washington. 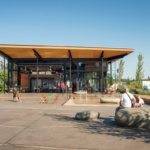 Kenmore is a bedroom community that sits on the northern edge of Lake Washington, a few miles north of the Seattle city limits. The town was originally founded in 1901 but did not incorporate until 1998. That development spawned a city-led push to remake the former speakeasy haven into a town with a traditional, communal city center surrounded by mid-rise mixed-use structures. 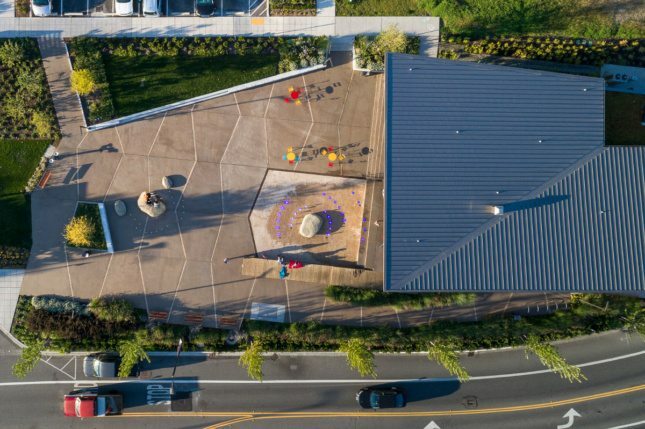 The municipality is currently redeveloping a series of city-owned lots, with the Kenmore Hangar and the attendant Town Green being among the first projects to come to fruition so far. HEWITT is working as the project executive for the Town Green designs, while GBA led the design of the Kenmore Hangar itself. The project’s aim, GBA Principal Jim Graham said, is to create a new “living room for the city” that could anchor the downtown area by harnessing the power of public open space. 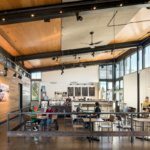 To fulfill this promise, GBA has deployed a humble brand of architecture, creating a steel post-and-beam structure wrapped in structurally insulated panels and ribbon windows. 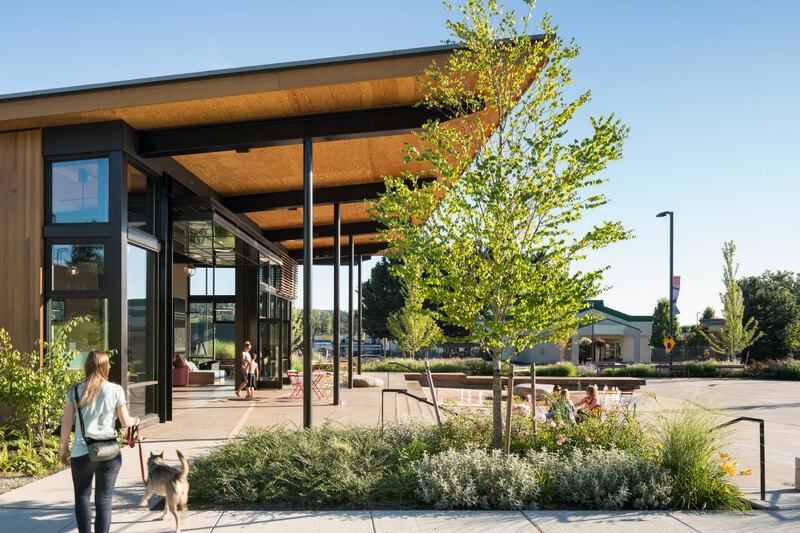 The community center offers movable interior partitions as well as aluminum clerestory storefront windows and a deep-set visor that creates covered outdoor space along two sides. 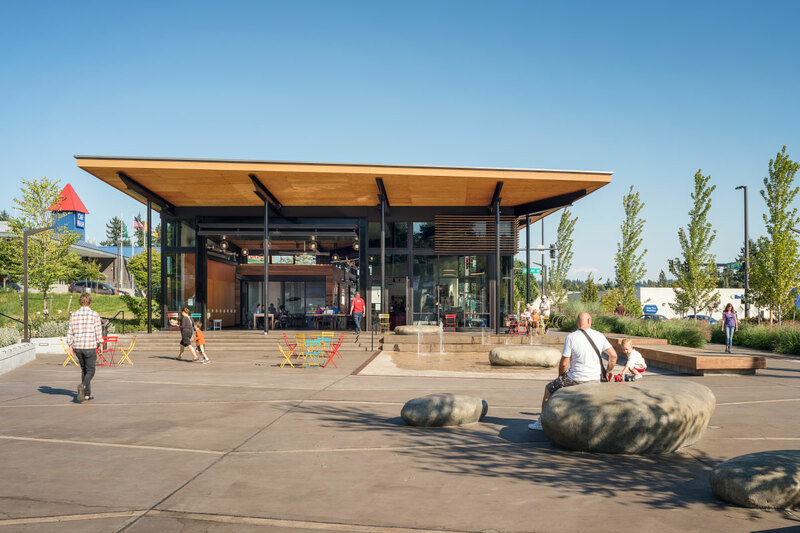 The clear cedar-siding-wrapped facilities host a local coffee shop that fronts onto a trapezoidal plaza populated by movable chairs, tree-filled planters, and an interactive fountain. A phalanx of ginkgo trees turns the site’s street-adjacent edge into a zone fortified against automobiles while the building’s louvers and eaves protect against solar glare. 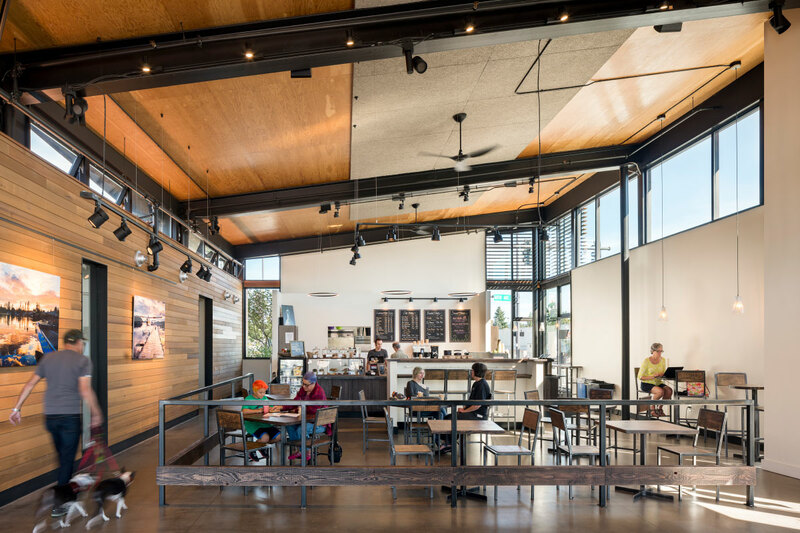 Inside the structure, exposed steel elements, drop-down lighting, ductwork, and a large fan lend the space a sense of pragmatic utilitarianism. 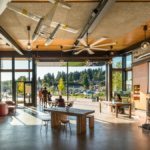 The divisible community room opens onto the 14,000-square-foot plaza via a 24-by-16-foot bi-fold window wall that turns the complex into an indoor-outdoor space. 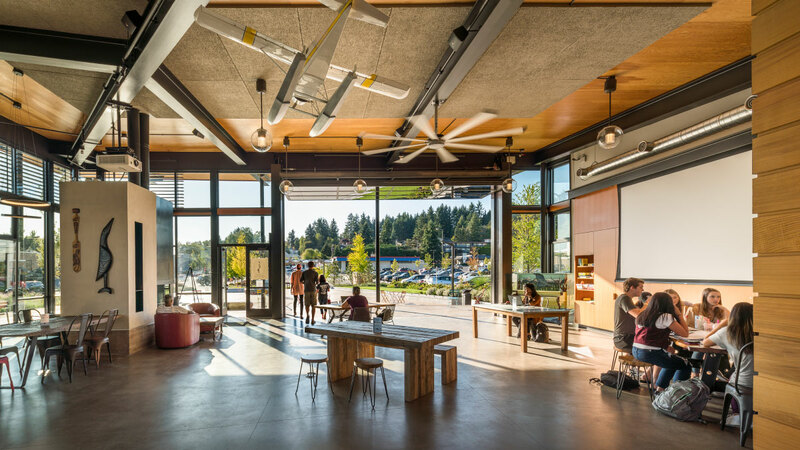 A wood-burning stove anchors the community living room while heated rocks embedded in the outdoor fountain create warm areas outside that allow the building’s uses to shift with the seasons throughout the year.